If you’re looking for a truly cheap smoke — something to absently puff on while you’re mowing the lawn or to hand out to acquaintances who wouldn’t know Rocky Patel from Rocky Colavito — you could do worse than picking up a pocketful of Cuban Rejects. Now don’t get me wrong. No one’s going to mistake a Cuban Reject for a Cuban puro, unless they’ve been smoking something mind-altering beforehand. But you aren’t going to get sick either. OK, I realize that’s not exactly a ringing endorsement, but don’t forget we’re talking about a stogie that you can get for just a shade over a buck. The biggest problem I had with the six inch by 50-ring gauge Toro maduro I tested was the smoke. It was extremely light and thin. The cigar wasn’t plugged. The draw, while a bit tight, wasn’t bad, and the burn was straight. The Reject just didn’t make much smoke. It also didn’t generate a lot of taste. I’d put it among the mildest of cigars, with the taste almost exclusively of light tobacco. On the other hand, one of the few consistencies among really cheap cigars is that they aren’t at all consistent. Who knows what your Cuban Reject might be like? I was curious about the cigar, since there’s not a lot of information on the web about it — and what little there is often conflicts. So, I called Phillips & King International, the tobacco distributor that imports and sells Cuban Rejects. The cigar was introduced in 2005 and, in addition to the Toro, comes in a Churchill (7×48) and a Robusto (5×50), all in natural or maduro. 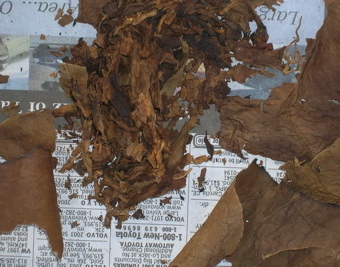 The cigar, as you can see from the photo of its innards on display, is a mixed filler made with all Nicaraguan tobaccos, according to Phillips. Though I wondered if it was machine bunched with the wrapper applied by hand, a Phillips spokeswoman told me the Rejects are all handmade. She also said they can barely keep up with demand, moving them out of the warehouse as quickly as they arrive from the factory in Nicaragua. I paid $1.35 for my Toro. If you check online, you’ll find them available in bulk — up to 200 at one site! — for as little as $1.05. Or visit some shops in your area that carry a wide range of tobacco products, not just premium cigars. I bet you’ll see a batch of the bandless Cuban Rejects. Now, whether you want to buy one or not, I leave up to you. Next up is the final installment on our Cook’s tour through the world of ultra-cheap cigars. Or, as I like to think of them, penny premiums. When you test a Reject, please test the original Rejects, by Nat Cicco who started it all, unlike Phillips and king they do not use the cheaper Homogenized wraper. I asked John Parker President of Nat Cicco about recent rejects imitating his cigars and the boxes that hold them, he said "I am flattered that my Rejects are being imitated, I take it as a compliment" John has retired last week, and sold his Nat Cicco to Zander-Greg of Pasadena, Ca. So please if you want to rate Factory Rejects, please rate the original. For 1.15, they're great. For two bucks they'd be average. They're not a nasty residue kinda deal that you'd get from a Dutchie. So I think it makes them a great value. You get more than you pay for. The ones I have from Phillips and King have no homogenized wrapper. They provide plenty of smoke, have a good draw and excellent construction. The local smoke shop sells them for .99 cents a stick in the robusto maduro size. I would put them up against any Consuegra anytime. I have smoked plenty of high end cigars, I travel a lot internationally so my experience includes all major brands of cubans, limited edition dominican partagas…etc. Bottom line dollar for dollar Cuban Rejects are best value smoke available. I personally smoke Robusto Naturals which I like a great deal and since I smoke at least one stick a day they prevent me from having to explain to my kids that the reason I can't pay for college is because I smoked their college education with a beer by the pool every night. They are also suprisingly consistent, sure there will be some dud's but not any more than you will find in a box of Arturo Fuentes. Granted taste will not be as strong nor as complex as a high end cigar but you will get 75% of the taste for 10% of the cost…. For an every day "not special occasion smoke"nothing better. I've tried finding them online buy I'm not having any luck. Any suggestions? Here's a link to a site selling the rejects. I started smoking cigars along with my first cup of joe while pulling 12 hour shifts on Freedom Bridge on the Korean DMZ back in 1969. For the last 20 years its been one Robusto and a hot tub a day. I got used to dollar stogies and have recently found Cuban Rejects at Payless. Great smoke for a buck.